If at first you don't succeed, fail and fail again. That appears to be the strategy for this weekend's top new film, which attempts to revive one of the comic world's A+ properties that just hasn't connected. I, uh, have some bad news for them. In theory, I don't have any problem with trying to trying to remake films that didn't work – in fact, those are the ones that should be remade, but done properly this time. 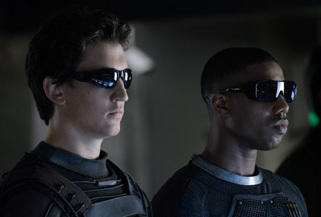 The Fantastic Four movies fall well into this category, as the Tim Story films were a tragic mix of miscasting, shoddy FX and a confused tone, so there's lots of room for improvement there. The unfortunate part: none of that seems to have improved too much this time around. Josh Trank was given the reins thanks to his surprise success at pulling something out of nothing with Chronicle, the found-footage superhero film. Whether that proves to be his flash in the pan, or whether there's just too much studio meddling here – or maybe it's a fundamentally unadaptable project (I find that hard to believe, c.f. The Avengers), but things don't look too good in any way shape or form. The cast has gone way young – in theory a decent move – with Reed Richards passing from aloof doofus Ioan Gruffudd to cocky douchebag Miles Teller, the Invisible Woman to Kate Mara, The Thing to Jamie Bell (conspicuously absent from the ads and press campaign) and Johnny Storm going to Michael B. Jordan and you know what, I don't want to hear it, comic nerds.